From Zen Monkey Studios. It's no use, no Morty can ever beat a Rick...except this one. 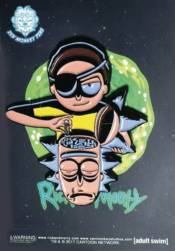 Check out Evil Morty as he defies all odds and takes control of his Rick. This original design was created by storyboard artist Erica Hayes, now measured as a 2 inch pin!